EUGENE, Ore. (AP) - C.J. Verdell scored on a 6-yard run in overtime and No. 17 Oregon knocked off No. 7 Washington 30-27 on Saturday. "It worked out well for us. 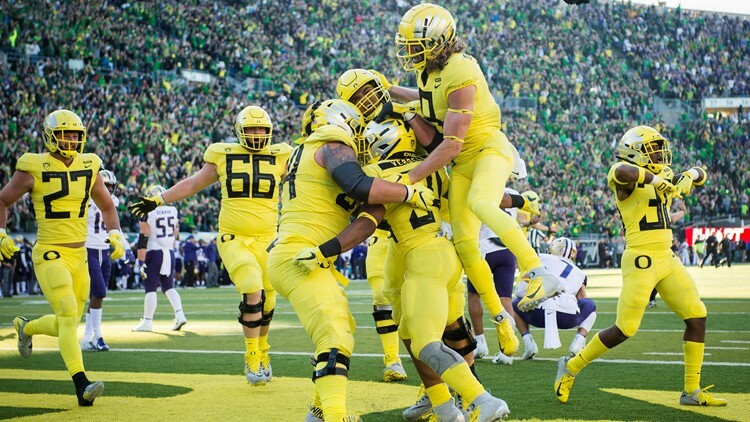 The game went into overtime and this time we finished the job," Oregon coach Mario Cristobal said. Herbert didn't have his best day, playing in front of a large gathering of NFL executives that included Denver Broncos GM John Elway. Herbert was 18 of 32 for 202 yards and two touchdowns - a 12-yardser to Mitchell and a key 9-yard strike to Jaylon Redd late in the first half that pulled the Ducks even at 17-all at halftime. Washington's Jake Browning threw for 243 yards and threw a 43-yard touchdown to Ty Jones in the third quarter. The Huskies played parts of the second half without their top two running backs after Myles Gaskin and Salvon Ahmed both left with injuries and played sparingly in the closing minutes.